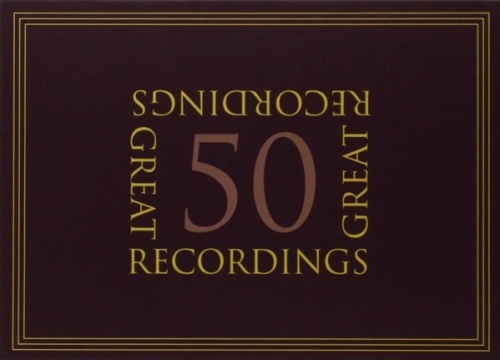 Sony's 50 Great Recordings is an impressive collection of historic releases, previously issued by RCA, Columbia, Mercury Living Presence, and Deutsche Harmonia Mundi, and many of these albums have been out of print for years. The 50-CD box set contains facsimiles of the original albums' art work, and listeners who have sought these discontinued or hard to find albums can have them in one convenient place. The roster of performers includes such famed artists as Leonard Bernstein, Pablo Casals, Rudolf Serkin, Fritz Reiner, Glenn Gould, Artur Rubinstein, Leontyne Price, Fritz Wunderlich, Vladimir Horowitz, Montserrat Caballé, Dietrich Fischer-Dieskau, Andreas Staier, Kathleen Battle, Wynton Marsalis, among many others. A cursory look at the contents shows that this is indeed a legendary company, and even if this may not be everyone's idea of a perfect list, every album on it has garnered critical praise and earned its place. There is a strong likelihood that dedicated collectors will already have many of these recordings in their libraries, so they should take a careful look at the contents to avoid duplication. However, newcomers to classical music will find that it provides exceptional renditions of the most essential works, and this is a valuable core for any growing collection. Variation 1 a 1 Clav. Variation 2 a 1 Clav. Variation 4 a 1 Clav. Variation 5 a 1 ovvero 2 Clav. Variation 7 a 1 ovvero 2 Clav. Variation 8 a 2 Clav. Variation 11 a 2 Clav. Variation 13 a 2 Clav. Variation 14 a 2 Clav. Variation 16 Ouverture a 1 Clav. Variation 17 a 2 Clav. Variation 18 - Canone alla Sesta a 1 Clav. Variation 19 a 1 Clav. Variation 20 a 2 Clav. Variation 22 Alla breve a 1 Clav. Variation 23 a 2 Clav. Variation 24 Canone all' Ottava a 1 Clav. Variation 25 a 2 Clav. Variation 26 a 2 Clav. Variation 28 a 2 Clav. Variation 29 a 1 ovvero 2 Clav. Act 1, Scene 1. Ritorna vincitor! Act 3. Qui Radamès verrà! Act 1, Scene 2. Che più t'arresti? Act 4, Scene 1. Timor di me? Act 1. Plauso! Voci di gioia / Sin la tomba è a me negata!